Recently on a Yammer board that @jonoble and I are members of, the question was posed about what people made of the news that Microsoft is rumoured to be developing their first new browser in, well, nearly forever. The question was about whether people thought this was a good idea or not for Microsoft? I ended up producing a long winded reply and thought that I might as well formalise my thoughts a bit further and post it here for posterity’s sake (not because I’m under the delusion that anyone will find it interesting beyond me in 5 years’ time!). So in a nutshell is Microsoft‘s new browser a good idea? Yes, yes it is. IE was forged back in the early days of the internet, by a Microsoft that was stuck in its ways and had a very desktop-centric view of the world. The world, and Microsoft, have now moved on and it is about time IE did the same. 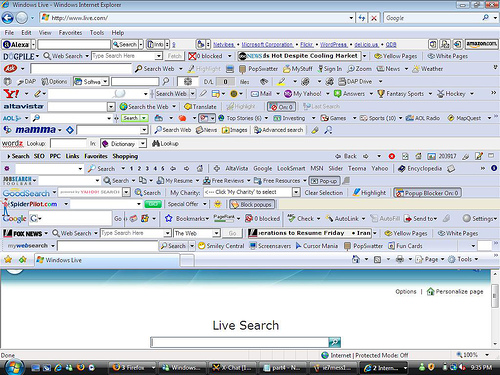 Internet Explorer was Microsoft answer when it became apparent that this “internet thing” was going to really catch on. I always think of IE as being included with Windows but actually IE 1.0 only shipped with Windows 95 Plus! Expansion pack. Back in these early days between versions 1-4 IE was actually pretty innovative in its own way. Microsoft added support for things like CSS and VRML, it has a plugin model (Active-X) that would allow third party companies to extend its capabilities i.e with flash and there were some nifty side effects from its OS level integration – Active Desktop anyone? I can very clearly remember talking about the release of IE4 (September 1997) at school when I was doing a GCSE in IT, does anyone else remember the wee Java 3D clock that they had produced as a demo that you could place on your desktop and move around independently like it was its own program! That months PC-Pro couldn’t come soon enough so that I could get my mitts on the install media to upgrade my poor old TechnICL Pentium 133 workhorse! Sadly, as with most things in IT I was starting to learn that reality could be a cruel disappointment. There is always a gap between how I perceive a feature should work vs how it has been actually been programmed. Active Desktop didn’t evolve into anything useful and was too much of a resource hog back when RAM & CPU were precious precious commodities. It was also horribly unreliable, replacing your wallpaper all too often with that white browser page containing a link down in the bottom right hand corner that would attempt to refresh the desktop page… Anyway enough memory lane. So what went wrong for MS and IE? Well these early IE versions were certainly not without their flaws. It was far from easy on system resources, it wasn’t designed with security in mind and as Microsoft had tried to push the capabilities of the browser it had implemented a whole stack of their own non-standards compliant HTML markup. With the launch of IE6 and Windows XP back in 2001 Microsoft held a huge monopoly over the browser market through its decisions to bundle IE with its own OS. A decision which had huge repercussions for Microsoft and something that would land it in hot water both in the USA and with the EU. This huge market share was bad for consumers in two ways. Firstly it presented a huge surface area for nasty people to target and secondly it seemed that Microsoft almost “gave up” at this point on any innovation in IE. On the security front IE was being targeted on two sides at once, by websites themselves with malicious code that could install and launch Active-X components in your browser and by other crap-ware on your computer that would load IE full of toolbars to the point where you had no browsing space actually left! As for innovation it would now be five years between releases, with IE 7 appearing in late 2006. Just think about that for a moment. Five years with no major versions or updates to a bit of software. That is something pretty much unheard of now for popular software. At about the time of IE7 Microsoft were starting to be left behind by Firefox and Opera. Any power user worth their salt had moved on to platforms that supported tabbed browsing and a truly flexible extension model allowing deep customisation of the platform, not just plugins or toolbars. These browsers were also generally much faster although not necessarily less resource intensive (Firefox 3.5 I’m looking at you). With IE 8 Microsoft made a big effort to comply with web standards but unfortunately the damage was done. While browsers like Firefox and Opera behaved in a mostly predictable way when rendering complex sites, IE was all over the place. IE 9 continued this trend of improvement but they were to some extent having to lie in the bed that they had made for themselves. While they fought to modernise and transform the browser into something that was much more standards compliant they were left having to support a huge tangle of legacy rubbish required by organisations who had deployed Line Of Business software reliant on a browser or the desktop (again IE hooks in deep). Out in the wider world PDA’s were morphing into smartphones and Microsoft had created a lite version of IE for their pocket platforms which did an okay job but again was left for dead by the completion from the likes of Opera mobile. With Windows 8 Microsoft had a new challenge on their hands. They had effectively split their operating system in half with the traditional desktop environment and the “Modern” full screen touch friendly portion designed for a new class of device. IE 10 therefore had two modes to it, one which ran on the desktop like previous versions and the other that was a full screen touch-optomised experience. As someone who in the last year had moved from using a Nexus 7 Android based companion device to having a Windows 8.1 8” tablet I had also started to re-visit Metro IE having given up on Firefox when they canned their pre-beta Metro version. Do you know what? IE 10 Modern is actually a pretty good browser. It has the best touch support, with things like gestures for navigation that I’ve come across but it still has its flaws. This is why the idea of Microsoft starting a clean browser slate seems to be an awesome concept… to be continued in Part 2!